Our quest in search of the Truth, the cause of this Universe, the Cosmos and the humans-ourselves is timeless, since (from) the time of the origin of the humans, and their understanding (however little that might be at that time, and, perhaps, even now!) we have been asking this question (may be for last several millions of years) and perhaps, might continue to ask forever! We, the finite humans - the mortals want to become immortals, to be remembered for ever, basically we do not want to die, we have fallen in love with life. We always want and seek immense happiness in our lives. We also want power and wealth as securities. We also want to understand as to what is the real truth behind all this drama of the Universe and the human lives. While we continue to search for the real truth, we observe several events and phenomena during our short lives on this planet. 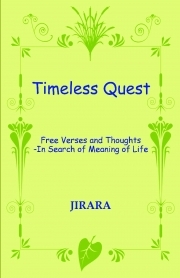 In this book, I have tried to express my thoughts about life and its worldly and philosophical facets in some compact and comprehensive manner. Hopefully these thoughts would lead us think of our redemption: from earthly bondages via true bonds to some of the eternities, may be in a gradual manner – I do not see any more or greater purpose than this of our (human life’s) existence on this planet. The thoughts expressed in this book are about life, its facets and the events as they unfold and affect us regularly, or seem to govern us. Most of these thoughts are of reflective type and should appeal to the readers and the teenagers equally from all walks of life. The reading of these thoughts cast in free style should and would prompt a self-analysis. It is up to the reader to call it as prose, prose-poetry, prosy poetry, unstructured poems, or free-style expressions or free-verse. Or do not call it anything, just read the passages and thoughts expressed in this book and reflect deeply into the events of life around, and in your own lives. The poetry here is meant to indicate something like: beauty (a beautiful relationship), serenity, nicety, goodness, goodwill, kindness, and/or some message that would enhance our awareness and would be a cause of ‘true’ joy in our ‘hearts’. One or more of these things in our lives would tend to make our life ‘poetic’. However, in some places the thoughts are expressed, I suppose, in the form of poems. The author was born in 1947 in India. He received BEE and MEE degrees from M. S. University of Baroda, Vadodara in 1971 & 1974 and Ph. D. from McMaster University, Canada in 1986. He worked as a scientist in National Aerospace Laboratories, Bangalore from 1975 to 1981 and 1986 to 2007. He has been fellow/senior member/member of many professional societies/bodies and has served on many administrative/technical/review/interview/examination committees. He has reviewed papers for several International Journals and visited several countries on deputation. He has guided many Master/Doctoral level students. He has guest-edited 4 special issues (two of ‘Sadhana’ from Indian Academy of Sciences, Bangalore, and two of Def. Sc. Jl., New Delhi). He has authored (jointly) four technical books (one published by IEE/IET, London, 2004, www.theiet.org; and three by CRC Press, USA, 2009, 2010, 2012, www.crcpress.com) in the area of his work and specialization. He has also published 160 papers & reports. He has also authored ‘Poetry of Life’ (Trafford Publishing, IN, USA, 2009, www.trafford.com) and ‘Sandy Bonds’ (www.pothi.com, India, 2010). His research interests are modeling, system identification, filtering, parameter estimation, data fusion, flight mechanics modeling & analysis, fuzzy systems, genetic algorithms, neural networks and robotics. Presently he is Professor Emeritus (Dept. of E&CE) in MS Ramaiah Institute of Technology, a private college in Bangalore. His reading interests are science, evolution and philosophy.